Union Budget 2017- Key Takeaways. It was the first time that the Railway Budget was not separately presented but incorporated into the Union Budget only. As a standard practice, the Budget has been introduced on the last day of the month of February every year (except for budget in the year of the elections). 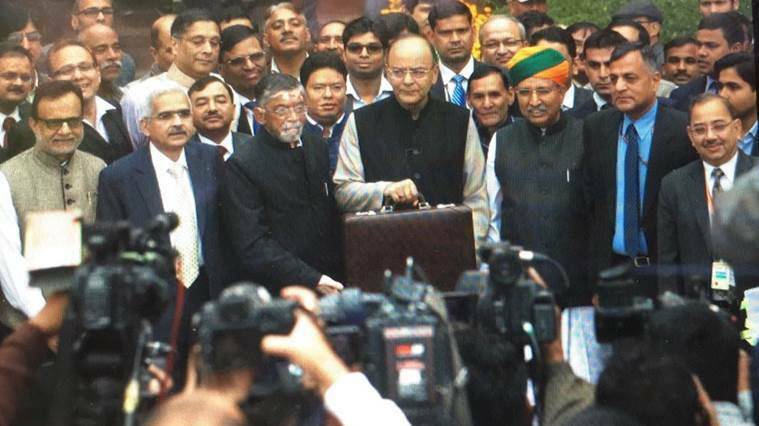 However, this time the budget was presented on the first day of the month of February. Agricultural Credit takeoff of ₹10 lakh crore in the budget. A long-term irrigation fund at NABARD by investing ₹40,000 crores. Dairy Processing Infra Fund of ₹8,000 crores in 3 years. Assistance up to ₹75 lakh for cleaning and packing agricultural produce. Highest ever allocation to MNREGA at ₹48,000 crores. ₹27,000 crore allocated for Pradhan Mantri Gram Sadak Yojna. For senior citizens, Aadhar based health cards to be issued. 1.5 lakh health sub-centres to be converted to Health Wellness Centres. AIIMS to be set up in Jharkhand and Gujrat. Affordable housing to be given infrastructure status, which will effectively allow cheaper funding for affordable housing. Transport Sector to be allocated ₹2,41,000 crores. Infrastructure allocation at ₹3,96,135 crores. Allocation for National Highways at ₹64,000 crores. The total amount allocated for railways will be ₹1,31,000 crores for next FY. A safety fund to be created of ₹1,00,000 crores. 25 Station re-development contracts to be awarded. 500 stations to be made disabled-friendly. A new Metro Rail policy to be announced for easy financing and implementation. Service Charge on ticket booking on IRCTC withdrawn. The Foreign Investment Promotion Board to be abolished and a new framework to be created. Railways Companies such as IRCON and IRCTC to get listed. Bank Recapitalisation to stay at ₹10,000 crores. Two new schemes for promotion of BHIM app. AADHAR pay to be launched shortly. Strengthen the legislative framework to freeze assets of economic offenders who flee the country. Target Fiscal deficit at 3.2% and revenue deficit at 2.1%. Cash Transactions over ₹3,00,000 not to be allowed. Holding period for Long Term Capital Gains tax on immovable property from three years to two years. The base year for indexation for LTCG to be 2001 instead of 1981. Carryforward of MAT credit for 15 years instead of 10 years. Slab rate for income between ₹2,50,000 and ₹5,00,000 to be reduced to 5%. Surcharge of 10% for those having a total income of ₹50 lakh to ₹100 lakh. This is in addition to 12% surcharge on income above ₹1 crore. Maximum cash donations to political parties from a single source which will be exempt from tax have been reduced from ₹20,000 to ₹2,000. Presumptive Taxation at 6% for assessees having only cashless transactions. Cash expenditure exceeding ₹10,000 shall be disallowed. TDS on commission to insurance agents at 5% abolished. Foreign Portfolio Investors (Category I and II) exempt from indirect transfer provisions. Domestic Transfer Pricing to be limited to cases where one of the entity enjoys specified profit linked deductions. Threshold limit for Tax Audit raised to ₹2,00,00,000. Threshold limit for maintenance of books of accounts raised to ₹25,00,000 turnover or ₹2,50,000 income. For profit linked income-tax exemption for promoters of affordable housing, carpet area should be 30/60 sqm instead of built up area. The period for completion has been extended to 5years. No reform in the existing structures of Indirect Taxation as they are to be replaced by GST soon. Swayam Platform for students having over 350 free courses. Centralised Defense Travel System for defense personnel, where tickets can be booked without the hassles of queues. Scheme for senior citizens to ensure 8% returns. Allocation of ₹10,000 crores for providing high-speed internet under Bharat Net Project. This list only covers items covered in the speech and not in the annexure. The above points are only key highlights, not covering all aspects of the budget.